Shrewsbury Town in the Community are delighted to announce that they are seeking applicants to join our new U6 & U7 Player Development Centre Squads based in South Shropshire. Kicking off on Thursday 7th March 2019 at Ludlow Football Stadium, the Ludlow Player Development Centre will run weekly from 4:50pm – 5:50pm. 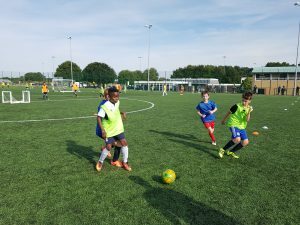 Player Development Centre sessions will focus on providing players with structured coaching sessions to enhance and improve their individual skills with fun and challenging small sided team games. The PDC will provide a platform for players to progress into our Advanced Development Centre Squads at Under 8 level. Players are encouraged to combine PDC/ADC Sessions with Grassroots Club Sessions to further enhance and consolidate learning. See where our player pathway is able to take individuals through our Advance Development Centre here.